The Arroyo Seco bike/walk path is damaged, apparently from last week's heavy rains. All photos by Joe Linton/Streetblog L.A. The Arroyo Seco bike/walk path is damaged, but remains passable. It appears that the damage resulted from last week’s heavy rains. 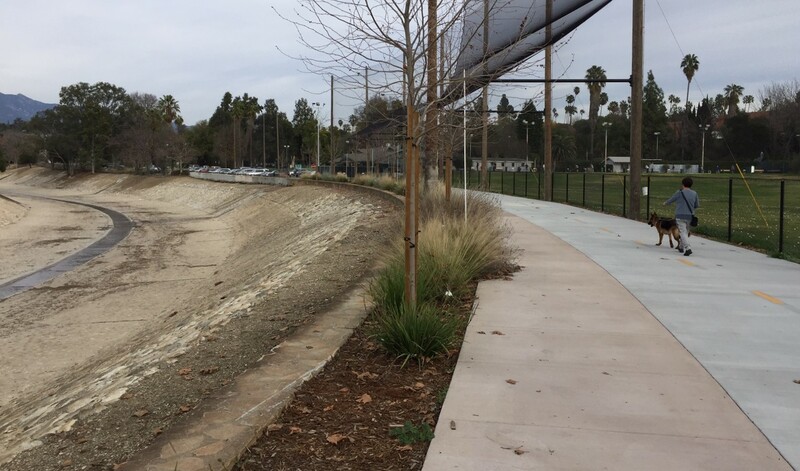 The 2.1-mile Arroyo Seco path extends from Northeast L.A.’s Montecito Height Recreation Center near Avenue 43 to Arroyo Seco Park near York Boulevard at the border of the cities of L.A. and South Pasadena. Unlike most southern California bike paths which run along the top of channel walls, the Arroyo Seco path is located in the bed of the channel. Reports of the damage first appeared in a Facebook post by the Eastside Bike Club, picked up by Biking in L.A. The most extensive damage is located just downstream of Avenue 64/Marmion Way. About ten feet of the path platform washed away. On Sunday, cyclists dismounted to cross the missing chunk of path. Pedestrians, of course, walked across. A smaller damaged area is located near Avenue 52. There a portion of a metal plate was dislodged. With the plate off, the path remains easily passable on bike, but the width is effectively cut in half. 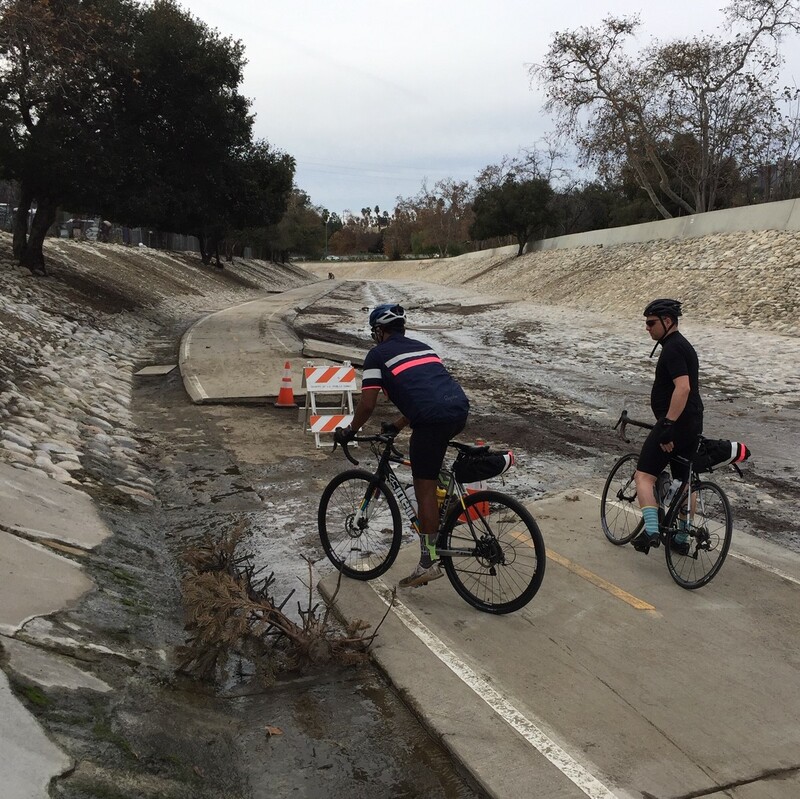 On Sunday, an L.A. County Flood Control worker on site mentioned that he thought that the city of L.A. would be responsible for repairing the bike path. This morning, Streetsblog emailed the L.A. Department of Transportation. When more details on repair plans are available, this article will be updated. 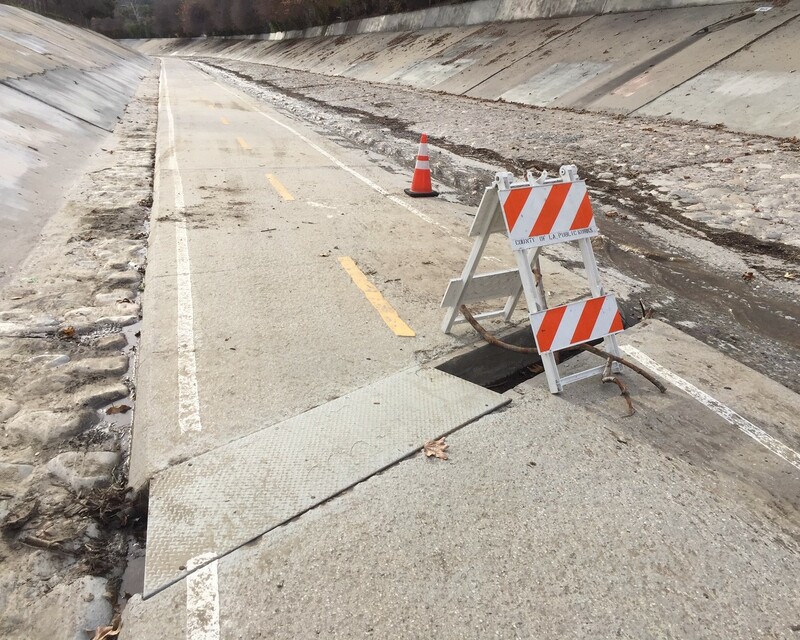 Added 2/7: Per LADOT email: LADOT is currently working with the Bureau of Street Services and Department of General Services for the permitting process to repair damaged pavement on the Arroyo Seco bike path. As soon as weather permits (dry season), we’ll have a better timeline of the project completion. In the meantime, we’ll continue to inspect the rest of the path and take necessary action to avoid any unforeseen issues. As you may already know County has already closed the entry to the path until further notice. 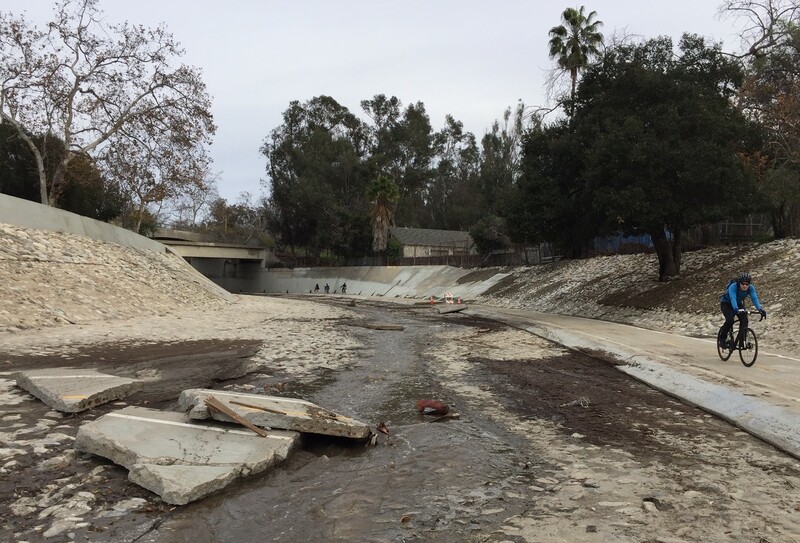 Note that the recently opened city of South Pasadena Arroyo Seco bike path (just upstream nearby) is along the top of the channel, undamaged, and open. 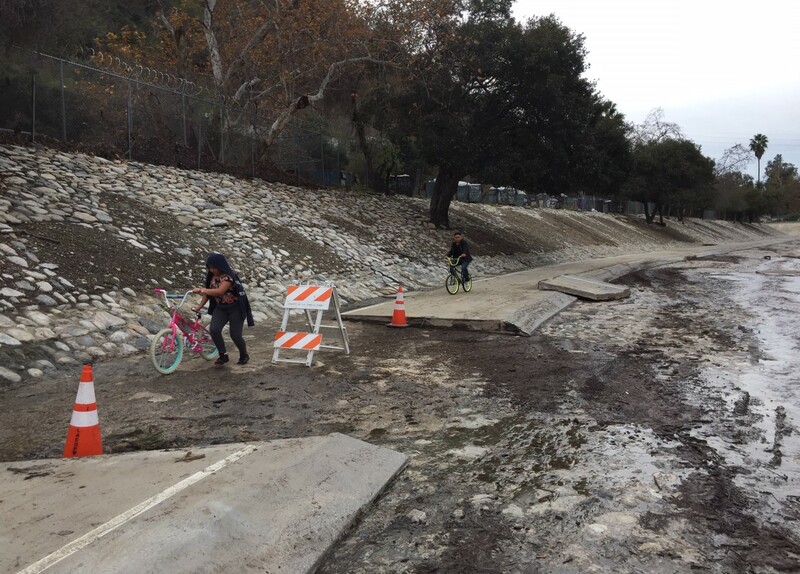 Added 1/23: L.A. City Councilmember Jose Huizar recently introduced a motion to close the gap between the two Arroyo Seco path segments in the cities of L.A. and South Pasadena. the walk-thru gates were getting locked closed Tuesday afternoon. flood control crew supervisor that stopped me at ave 60 told me the path is supposed to be closed until repairs are completed. they let me out there. i could have ignored him but the idea of having to climb over the gate at the stables with the bike was no bueno. I’m riding from Descanso Gardens down to Union Station on Saturday, 1/26. Can someone point me to alternative routes if the Arroyo bike path is closed? It’s not a bike facility – but North Figueroa is direct and relatively flat. The city of L.A. opened its new Riverside Drive Bridge, featuring a protected bikeway and roundabout. The project was praised for safety improvements, but the oversized project is really about moving more cars even faster. Metro is hosting input meetings for the conceptual design for the L.A. River path through central L.A. The $365 million 8-mile project is expected to open circa 2025. New Protected Bike Lanes On Monterey Road In Northeast L.A. The city of L.A. recently reconfigured bike lanes on Monterey Road, adding a short stretch of protected bike lanes through the historic Monterey Road Pass.